Continuing to work on the spider sculpture. This piece will be free-standing. I am using 3/8 inch round rod for the legs. The body profile is made from 1/2 inch square bar. The spider will have six shiny green glass eyes to watch over the garden. I used a huge old washer to attach the spindly legs to the body. That is capped with a steel dome for a cleaner look. Next up the teeth and eyes. 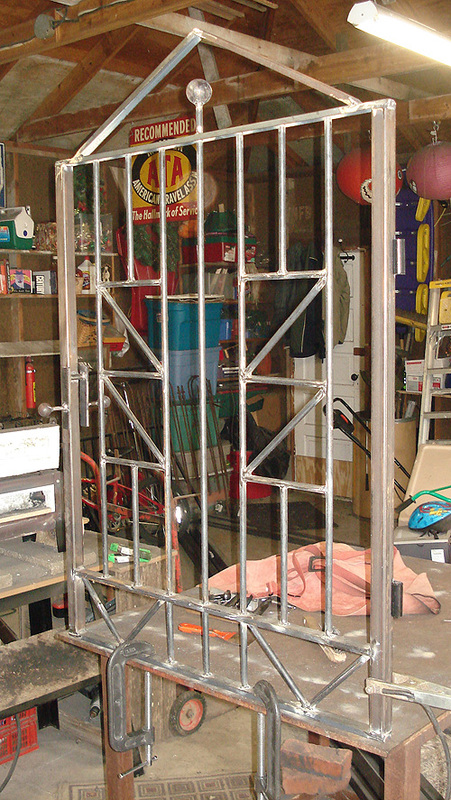 Here are a couple shots of a just finished gate. The piece is welded up, but needs to be cleaned and ground. The gate frame is 1.5 inch square tube. The interior design is mostly 1/2 round bar. All this makes for a sturdy (heavy) entry that will do its job. The gate swings on simple post hinges. I will post some pics of the gate and fence here soon. The latch is horseshoe-style, using steel balls for hefty knobs. When latched, it rests on steel tongues attached to an adjoining post.